I love Michael Pollan’s books and documentaries such as Food, Inc and Fat, Sick and Nearly Dead were right up my alley. I don’t think that it should be so difficult to eat real food. 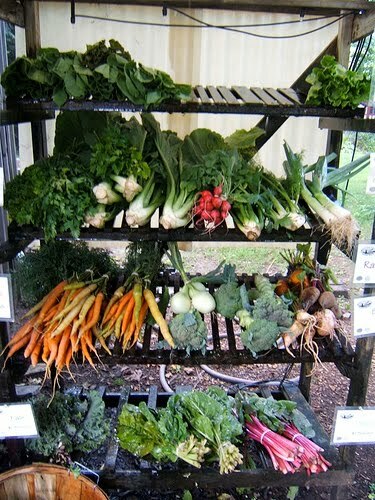 It is a priority in our life to find the best food for our family including local milk, cheeses, and veggies. It makes me especially sad to see children bombarded with artificial colors, flavors, and truckloads of sugar. This standard American diet (SAD) is wreaking havoc on the health of our families. Recently I was introduced to a website called 100 Days of Real Food. The website originally chronicled Lisa Leake and her family’s adventures of eating 100 Days of Real Food. She was a mom that didn’t read food labels, never bought organic and used processed food on a daily basis. After getting a wake-up call, she changed their diet and now helps families everywhere to make these positive changes for their family. I just learned that she grew up here in the Knoxville area and she is very excited to have us take part in her 10-day challenge. I personally love challenging myself on the road to self-improvement. I read about the 10 Day Challenge on Lisa’s website and thought my family can do that. I feel we basically eat a healthy diet, probably about 80 percent of the time. We eat whole grains, get our milk locally, support our farmers markets, eat lots of fruits and veggies. However, I know there is room for improvement in our diet. I personally don’t feel that sugar is evil in moderation. I do feel eliminating sugar from our diet will be the hardest part of the challenge. I do bake often with maple syrup and honey, but I do have a habit of having a piece of dark chocolate every day. While I don’t necessarily think that is bad, I do think I need to cut down on my family’s sugar intake. I think my children will be the ones that will benefit the most from the challenge. It’s amazing that no matter where we go people are offering artificially colored lollipops to my children. So would you like to join us on our 10 Days of Real Food Challenge? The Rules are pretty simple. You eat whole foods, whole grains, whole milk, nothing skim or low fat. So you load up on your fruits, veggies and enjoy your local meats and seafood in moderation. I think the hardest aspect is no refined sugar, only maple syrup, and honey as natural sweeteners. Some packaged food is allowed if it doesn’t have more than 5 ingredients and they follow all the whole food rules. Please visit here to see all the rules in more detail and to have any questions answered. I really think my area, Knoxville, has some great local food resources. I’ve already discovered a great bakery that grinds their own grains and has a fantastic whole grain bread with under 5 ingredients. I will be exploring all that Knoxville has to offer for real food resources including farms, grocery stores and restaurants. I”m looking forward to finding more in my community. Many other bloggers will be joining me, I’ll be linking up with them throughout the 10 days. I have created a board on Pinterest with some delicious food ideas to use on this 10 Day challenge. I’ll be posting daily our food choices successes and struggles on Facebook. I hope you’ll join us one way or another. Please share your favorite real food resources, recipes and ideas. This post is part of Simple Lives Thursday and Real FoodWednesday. These are fantastic sources for Real Food inspiration! and the "Play" Goes On..
Have you been playing along this week? I posted earlier about the 30 day Hands On Play Challenge hosted by The Imagination Tree and Hands on As We Grow for the month of November. As busy parents, it’s easy to get distracted from our best intentions of focused play with our children each day. This is a great challenge that offers us some daily playing cues to keep our play interesting and exciting. I’ve really been enjoying it. For the most part, we’ve been following the cues, with a few changes here and there. The kids loved the island play and that has been requested a few times. We even played at Nanny’s house and had her join in. Of course, we were jumping over shark infested waters, ahh! I love the fact that we start with the idea of 15 minutes of uninterrupted play but it usually grows into a half an hour or more. 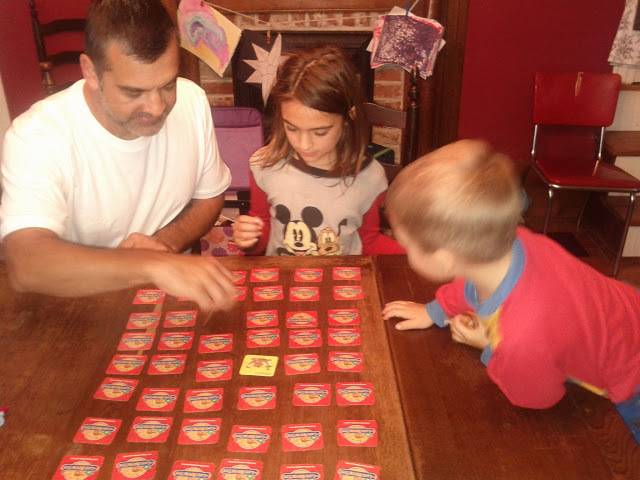 Sunday was about family game time. We have a lot of board games, but struggle using them because of the big age gap between our youngsters. So in playing a board game together, a few adjustments in the rules comes to order. So in other words, we kind of make up some of our own rules so we can all have fun together. I’ve found playing together early in the day works best. The kids are thrilled we started the day playing, they are less likely to be clingy for attention in the afternoon. It’s also a good way to start the day enjoying the moment and not being caught up in to-do lists. Many of these activities lend themselves to independent play time later in the day. Have you found that in your home? We really enjoyed the doodle challenge this week! We got giant pieces of paper and taped it to the floor.We all drew together. 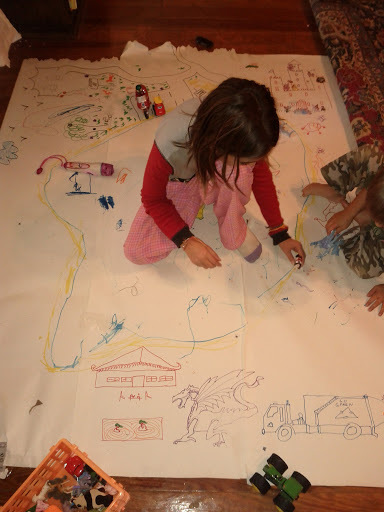 The kids then started to come up with ideas for dragons and castles, then a few dinosaurs and oddly enough a tea house, garbage truck and zoo were thrown in the mix. It was a great activity that was played with for the next 2 days. The kids loved it. We’ll be doing this more often. Then it was time for water play. It was a warm, sunny day here in TN yesterday. We took this as an opportunity to get outside and play. 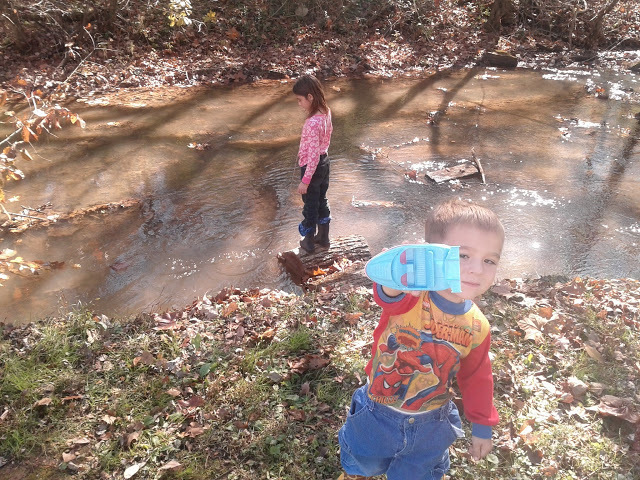 We headed to the creek and had boat races. Next time we’d like to make our own boats. This time, we just grabbed a boat from our bath toys for Lil Z, and cut off the bottom of a box for Big Z’s boat. They worked and we had fun cheering and using sticks to get them from being stuck. Afterwards, the kids had a warm bath and some time for more water play. We used watercolors to paint the bathtub, and the kids painted themselves. Play dough and sensory tubs were other playing cues for this week. Our play hostesses have some great recipes for homemade play dough on their sites. Counting Coconuts is my favorite site for sensory tub ideas. 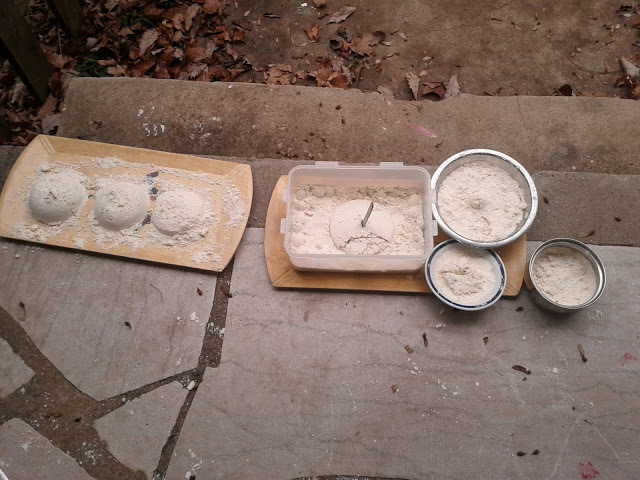 We made a simple recipe of 8 cups of flour and 1 cup of baby oil to make a sort of sandy dough (think moon sand). Use the cheap flour, no use in wasting your organic King Arthur on play dough. I had a few bottles of baby oil that needed to be used, so it helped clean up my bathroom clutter too, cool! We made a whole day out of play today. We met friends and went to the local children’s museum. It gave me some great ideas to use at home. Puppets, musical instruments, trains, dress up and playing rocket ship. Many of the play rooms at our museum are very simple. It goes to show that kids really just want to play and be creative. They don’t need fancy new toys with bells and whistles. They really just want our undivided attention and focus for a portion of the day. What a great gift, don’t you think? Author childorganicsPosted on November 11, 2011 February 10, 2016 Categories Organic Learning, Organic Parenting, Parenting Resources, RecipesTags playful parenting2 Comments on and the "Play" Goes On..